Requests for funding support generally far exceed the funds available. For this reason, criteria and priorities have been established to assist the Directors and staff in deciding where the funds may be most effectively employed for the betterment of the community. The impact of the Foundation’s grant making will be judged not only by the financial resources given to the community organizations, but also by the innovative and collaborative relationships the Foundation has with its grant recipients and the impact that the grants have had on the community-at-large. A list and maps of the geographical area that PCHF supports is available. Click the title or ► to learn more about the funds available. Information about our Mini Grants is available on a separate page. 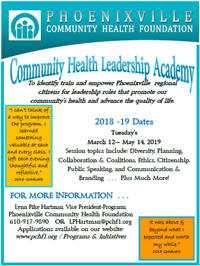 Ensuring equitable access to high quality and affordable health and human services for all residents in the greater Phoenixville region. Improving the availability of healthy, safe and affordable housing opportunities for low-income, vulnerable populations. Enhancing the quality of life in the greater Phoenixville region by investing in non-profit capacity-building and community development. Advancing collaborative and innovative solutions by forging strategic alliances, partnerships, and the integration of services that reduce service duplication. Phoenixville Community Health Foundation utilizes an electronic grant Request format. Click here to access our application system.